Welcome to chengduguoli 600w double switch led grow light with full spectrum , daisy chain design and upgraded aluminum cooling heat sinks, is ideal for all kinds of indoor plants veg and flower at all growth stages. chengduguoli has specialized in researching and developing environmental-friendly and user-friendly LED grow lights. - Spectrum: 380-800 nm full spectrum include visible light, IR. - Use for veg and flowering at all growth stages. - Working environment : -20~40degree; 45%RH~90%RH. -No extra ballast is needed,plug and play. 1.Extremely bright, do not look directly when the light is working. 2.Indoor use only, not water-proof. 3.2 IR LEDs is hard to see clearly by eyes, very dim.Please don't think they are not working. Instead, it plays an very important role in the flowering and fruiting stages of plants. 4.Please contact us via Amazon message for any questions. ✿MAYGROW reflector-serie 600 watt LED grow light is scientifically engineered to keep the balance of the PAR output and coverage. 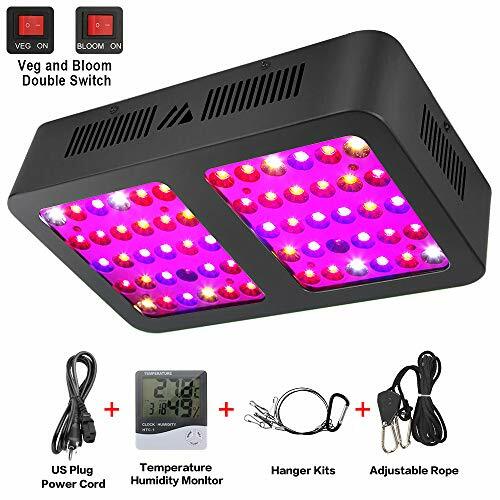 ✿The advantage of the MAYGROW LED grow light is the optimal full spectrum light, VEG/Bloom double switches privde 3 light modes to control for full spectrum which provides veg and flower all stages everything they desire in the natural sunlight. ✿Compares to traditional 600 watt HPS/MH while consuming only 116 watts! Perfect for a 3ft x 3ft vegetative coverage at 32" , while 2.5ft x 2.5ft flowering coverage at 22". ✿2 advanced high speed quiet fans and upgraded aluminum cooling heat sinks are easy for heat dissipation. ✿3 years warranty and 30 days satisfaction or return guarantee. If you have any questions about this product by MAYGROW, contact us by completing and submitting the form below. If you are looking for a specif part number, please include it with your message.